Product #60612 | SKU 6-125 | 0.0 (no ratings yet) Thanks for your rating! The Cinegears Ghost-Eye Wireless HDMI & SDI Video Transmission Kit 1000M ENG (Gold Mount) can be powered via Gold mount batteries. The transmitter incorporates a battery plate with pass-through power, enabling you to power both the transmitter and your camera with a single Gold mount battery. Supporting up to 1080p60 video with 10-bit 4:2:2 colour, this wireless video system offers 3250'/990m line-of-sight transmission and HDMI/SDI cross-compatibility. System features include SDI loop-through output, time-code support, low <1 ms latency, and accurate REC start/stop functionality. The 1000M ENG Transmission Kit is cross-compatible with other Ghost-Eye components, and can be paired with an unlimited number of Ghost-Eye receivers. 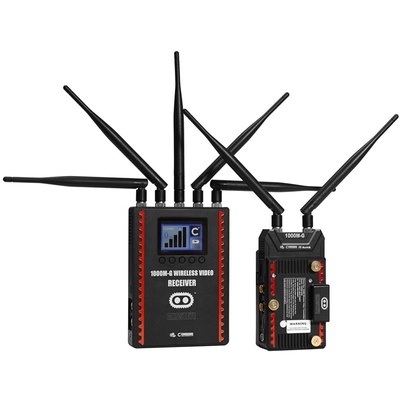 The transmitter and receiver both incorporate an LCD display, 2-pin LEMO connector (D-Tap to 2-pin LEMO cables included), mini-USB port, and on/off switch. Both the 1000M ENG Transmitter and the Receiver feature heavy-duty housings with durable, inset SDI connectors that minimise the chance of port damage. The transmitter's auto-link function is useful for travelling shots, relinking the transmitter once it's returned after travelling out of range. A waterproof case is included for transporting the kit components.